February 2, 2015 0 comments on "DIY Heart Stamp for Valentine’s Day"
I am always looking for fun, easy Valentine’s Day crafts to do with my kids. I saw this easy DIY heart stamp on Pinterest and just had to give it a try. It is such a cute idea. 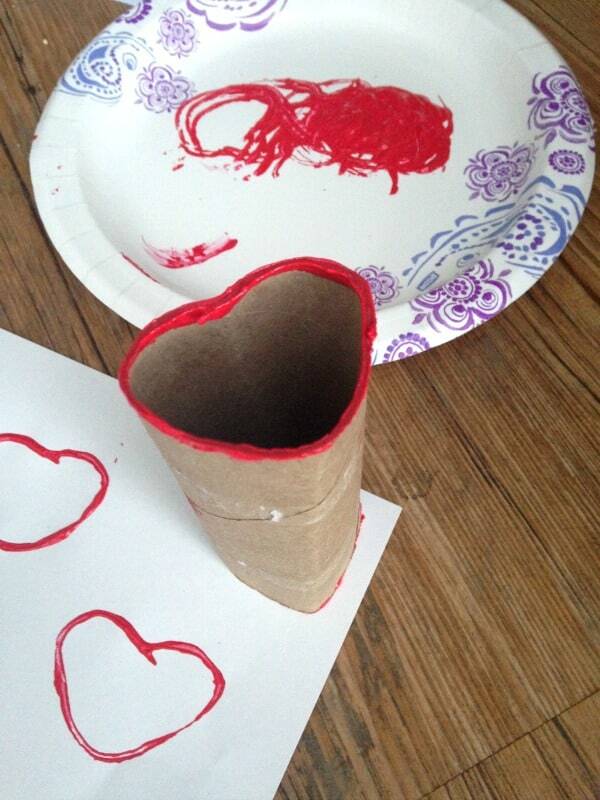 I mean who thought to turn an empty toilet paper tube into a heart stamp? This would be a fun project to do with preschoolers. You could use the stamps to create custom gift wrap, gift bags, Valentine’s Day cards, or to just use to stamp on paper for fun. First bend the toilet paper tube into the shape of a heart. I thought it was going to be hard at first, because the tube was a little stubborn when I tried to bend it. Finally I pressed the long side of the tube into the edge of my kitchen counter, and this created a long crease for me to work with. Just keep bending and molding until you get the shape you want. I found that after I got it the shape I was looking for it stayed in place fairly well when we used it to paint. 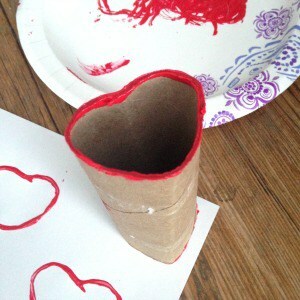 Place some red craft paint on a paper plate and then help your child get some paint on the entire edge of the toilet paper tube. Show your child that it is important to press evenly when creating a stamp on the paper or the heart will not completely transfer to the paper. That’s it! This simple stamp only takes a few minutes to make and will provide lots of fun for your kids. I think I’m going to keep mine to use to make homemade Valentine’s Day cards. I really like how this heart stamp turned out. Follow my Valentine’s Day board on Pinterest.